Gary Gordon was born on August 30, 1960, in Lincoln, Maine. He enlisted in the U.S. Army on December 4, 1978, and was trained as a Combat Engineer. 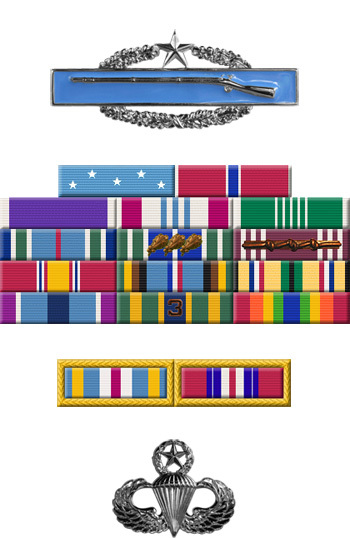 Gordon became a Special Forces Engineer in March 1980 and served with the 2nd Battalion, 10th Special Forces Group at Fort Devens, Massachusetts, until November 1986. During this time, he completed French Mountain School (1981) and Ranger School (1982). In December 1986, Sgt Gordon joined the 1st Special Forces Operational Detachment-Delta at Fort Bragg, North Carolina. He advanced from Team Member, to Operator, to Assistant Team Sergeant, and finally to Team Sergeant. He participated in the Invasion of Panama in December 1989 and January 1990, and deployed with other Delta Force members to Mogadishu, Somalia, in the summer of 1993 as part of Task Force Ranger. MSG Gordon was killed while protecting a downed helicopter pilot during the Battle of Mogadishu on October 3, 1993. 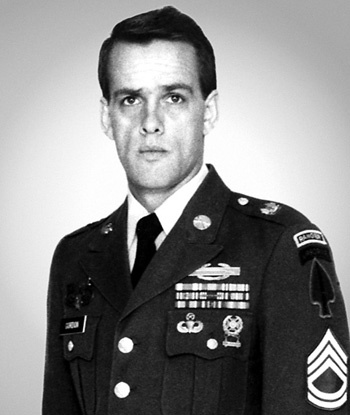 Master Sergeant Gordon, United States Army, distinguished himself by actions above and beyond the call of duty on 3 October 1993, while serving as Sniper Team Leader, United States Army Special Operations Command with Task Force Ranger in Mogadishu, Somalia. Master Sergeant Gordon's sniper team provided precision fires from the lead helicopter during an assault and at two helicopter crash sites, while subjected to intense automatic weapons and rocket propelled grenade fires. When Master Sergeant Gordon learned that ground forces were not immediately available to secure the second crash site, he and another sniper unhesitatingly volunteered to be inserted to protect the four critically wounded personnel, despite being well aware of the growing number of enemy personnel closing in on the site. After his third request to be inserted, Master Sergeant Gordon received permission to perform his volunteer mission. When debris and enemy ground fires at the site caused them to abort the first attempt, Master Sergeant Gordon was inserted one hundred meters south of the crash site. Equipped with only his sniper rifle and a pistol, Master Sergeant Gordon and his fellow sniper, while under intense small arms fire from the enemy, fought their way through a dense maze of shanties and shacks to reach the critically injured crew members. Master Sergeant Gordon immediately pulled the pilot and the other crew members from the aircraft, establishing a perimeter which placed him and his fellow sniper in the most vulnerable position. Master Sergeant Gordon used his long range rifle and side arm to kill an undetermined number of attackers until he depleted his ammunition. Master Sergeant Gordon then went back to the wreckage, recovering some of the crew's weapons and ammunition. Despite the fact that he was critically low on ammunition, he provided some of it to the dazed pilot and then radioed for help. Master Sergeant Gordon continued to travel the perimeter, protecting the downed crew. After his team member was fatally wounded and his own rifle ammunition exhausted, Master Sergeant Gordon returned to the wreckage, recovering a rifle with the last five rounds of ammunition and gave it to the pilot with the words, "good luck." Then, armed only with his pistol, Master Sergeant Gordon continued to fight until he was fatally wounded. His actions saved the pilot's life. Master Sergeant Gordon's extraordinary heroism and devotion to duty were in keeping with the highest standards of military service and reflect great credit upon him, his unit and the United States Army.